Wow!!! Really Gorgeous card Olga!!!! Beautiful!! I love kraft and white together. I already follow by email. Beautiful card and well-done tutorial. Thank you! Such a delightful card! This is a really stunning die. I really enjoyed the video too. Very clever and just gorgeous! Thanks for sharing. I love that die and the card is so delicate and beautiful!! This is gorgeous! I love all the texture. What a fun card! Very pretty card. 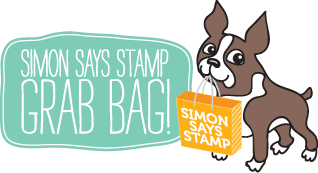 I have this embossing folder and I am going to try this. There’s so much to love about this card. The textures are especially delightful! Very elegant! Always love seeing Olga’s classically beautiful cards. Thanks for sharing one here to welcome in the New Year. Beautiful card Olga! Haopy New Year to you and yours. Beautiful tutorial Have subscribed to your channel. A truly fantastic creation! Happy New Year, Olga! Beautiful card and so clever. This is beautiful! So classy. Fabulous card, thanks for sharing this design with us. It is simply beautiful. WOW Olga, you are amazingly talented, your awesome ideas are seemingly endless and I love it! 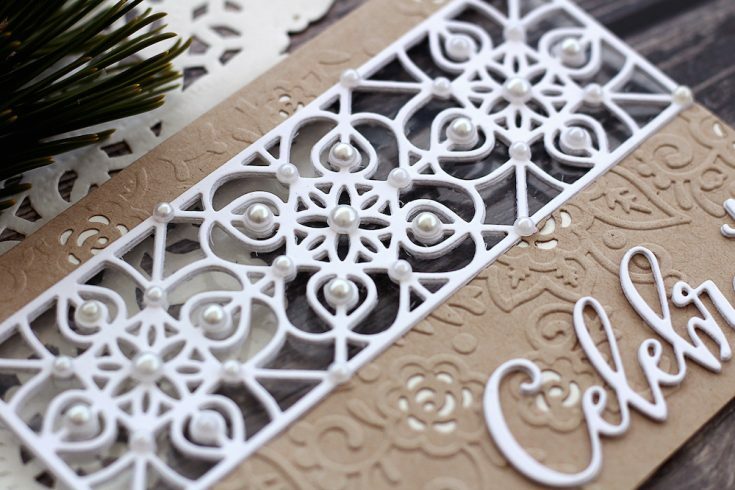 Such a stunning card, this die is so elegant and intricate, its perfect for your design. I love cards like this super pretty! Great idea for a card and beautifully done! This see-through lattice card is amazing! Olga created such a beautiful project. I love it. Wow! Really like this unique card!! Thanks for the awesome tutorial too! Beautiful Olga. Love the video and awesome dies. Cant go wrong with Kraft. Love your card. I ALWAYS LOVE OLGA’S CARDS. WOULD LOVE TO SEE MORE OF HER. This card is so pretty and the classic colors make it beautiful. I enjoy all the wonderful holiday cards and tags. Hope all had a merry Christmas. BEAUTIFUL Design!! Thanks for sharing the Video too!! 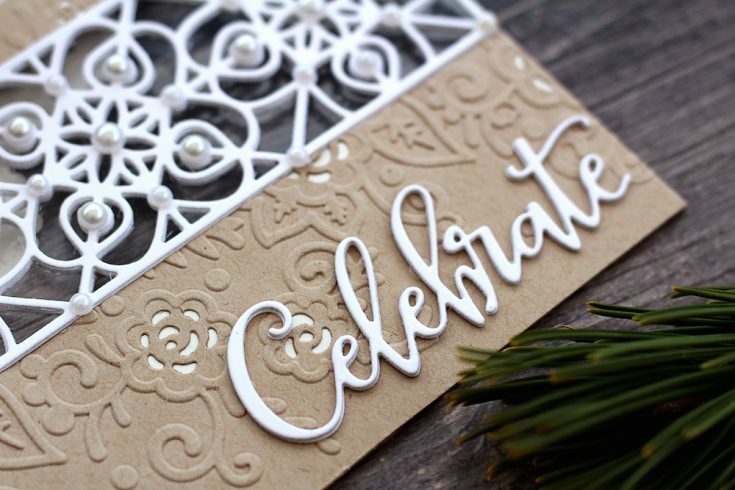 Beautiful CAS and elegant this combination of diecutting and embossing! I love this see-through card! It was a nice surprise to discover there are embossing folders that have die cuts in them as well. I have never seen them before! This one is beautiful, too! Love to see you here as a guest Olga, your cards are always stunning, elegant and you use dies on a unexpected way. Thank you for showing this awesome card. Such an elegant card. Great technic! Gorgeous card! Thanks for the clear and detailed explanation in the video. Gorgeous card! Amazing texture and dimension! Like the openness & layers of this creation. 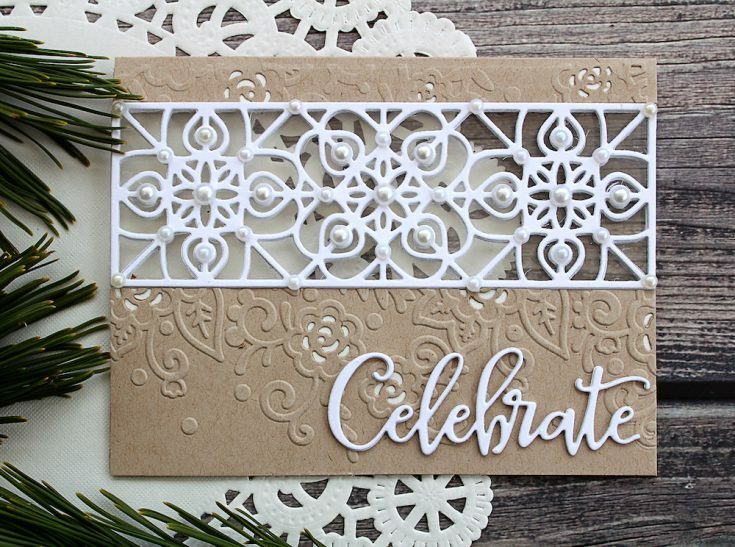 Beautiful card, that lattice die is so pretty. WOWZERS!I absolutely love this technique, I will definitly try this! Beautiful card Olga! Your choice of colors and the embossing make it super elegant! Thanks for the inspiration, I need to remember to make see through cards more often! I just love the lattice design and the embellishments! Such beautiful and elegant card!! Perfect for New Years! This card is very unique and classy. I love it ! Our 2018 Limited Edition HALLOWEEN Card Kit: Frightful Fun!